A collection of letters : Correspondence between Gandhiji and Ambedkar. AMBEDKAR: We must accept that in the country there are two groups belonging to two different ideologies and act accordingly, and I should get my compensation. I also want that a clear understanding should be arrived at which would recompense me in other respects also. The decision of the Government gives me seventy-one seats and I feel that is a just, reasonable and definite allocation. A. Over and above that I get the right to vote and contest elections in the general constituencies. I also have a franchise in the labourers’ constituencies. We do realize that you are of immense help to us. G. Not to you personally. A. But I have only one quarrel with you, that is, you work for the so-called national welfare and not for our interests alone. If you devoted yourself entirely to the welfare of the Depressed Classes, you would then become our hero. G. Very sweet of you to say so. A. I want political power for my community. That is indispensable for our survival. The basis of the agreement therefore should be: I should get what is due to me. I wish to tell the Hindus that I should be assured of my compensation. G. You have clarified your position very beautifully. However, I should like to ask you one question. You say that if there is any genuine party among the Depressed Classes it should be given sufficient scope to rise. Therefore their refusal to accept joint electorates without primary elections is quite reasonable. What I do not understand is why you have not said so far that there should be a separate election of this kind. I feel from whatever study I have made of the subject that if I accept the primary election, the letter of my vow is not violated. I therefore accept the Clause [of primary election] but I would most certainly have to scrutinize its wording. At the moment, I say only this, that the idea of separate primary elections does not go against my vow. But I suspect something when you insist that the panel should consist only of three candidates. It does not give me sufficient place to turn in. Moreover, you consider panel system for some seats only, thereby satisfying both the parties [among Harijans]. There would be one election, i.e., of the primary nature by the Harijan voters only. The other would be by the joint electorate. I have to safeguard without any discrimination not the interest of one group alone but of the Depressed Class as a whole. I want to serve the untouchables. That is why I am not at all angry with you. When you use derogatory and angry words for me, I tell myself that I deserved that. I will not get angry even if you spit on my face. I say this with God as witness. I know that you have drunk deep of the poisoned cup. However, I make a claim, which will seem astounding to you. You are born an untouchable but I am an untouchable by adoption. And as a new convert I feel more for the welfare of the community than those who are already there. At the moment I have before my eyes the dumb untouchables—unapproachables and unseeables—of South India. I am scrutinizing the scheme to see how these people will be affected by it. You will of course say why I should worry about that. All of you will either accept Christianity or Islam. I say that you may do whatever you like after my body falls. What I say is that if the panel system is good for the Depressed Classes it should be good for the entire electorate. I do not like it from the beginning that the community should be divided into two groups. I will raze to the ground the fort of sanatanists with dynamite if all the untouchables are one and united. I want that the entire untouchable community should unitedly rebel against the sanatanists. You should not worry about the number as long as the appointing power is in your hands. I am a lifelong democrat. The whole world will agree that I was the foremost among the democrats after my ashes are scattered in the air or, if that does not happen, after they are immersed in the Ganga. I do not say this out of pride but tell the truth with humility. I learnt the lesson of democracy at the tender age of 12. I quarreled with my mother for treating the domestic sweeper as an untouchable. That day I saw God in the form of a Bhangi. You spoke the truth when you said that the welfare of untouchables is dearer to you than my own life. Now be honest and stick to it. You should not care for my life. But do not be false to Harijans. My work will not die with me. I have asked my son to convey my message to the Conference. In that, I have said that they should not be tempted to forsake the interests of the Harijans in order to save my life. I am sure that if I die my son will definitely follow me. Not only he but many others also will lay down their lives, for I do not have only one son, I have thousands. He would not be my worthy son if he did not lay down his life for the honour of Hinduism. Without eradicating untouchability root and branch the honour of Hinduism cannot be saved. That can only happen when untouchables are treated on par with caste Hindus in every respect. A person who is regarded as ‘unseeable’ today should also have the opportunity to become the Viceroy of India. I had said, in the first political speech I made on coming to India that I would like to make a Bhangi the President of the Congress. So I appeal to you not to haggle. Do not bring to me something, which is so bad that I would not even like the look of it. Bring to me some nice present, which would inspire life into a person who is willingly courting death. However you will do that only if you are convinced that my co-operation has some value. AMBEDKAR: I have not come to discuss untouchability but political matters. GANDHIJI: That is true. I cannot talk about it with you; even if you do I shall not be able to express an opinion—my mind does not work in that direction. A. I have come here for this. I want to request you to give up civil disobedience and to join the Round Table Conference. The point is that if you do not come, we shall get nothing in England and everything will be upset. People like Iqbal who are enemies of the country will come to the forefront. We have to work any sort of constitution. Hence though I am a small man, I request you to come. G. If you elaborate your argument, I shall think over it. I suggest you go and write about it at length in the newspapers. I shall think over it. A. It is not a thing that can be put down in writing. In it I shall have to say a lot that will hurt the Muslims and I cannot say that publicly. But I shall write anonymously or have someone write in a different way. Please have a look at it and, taking it to be mine, think over it. G. It will be good if you write under your own name. But of course you may do as you wish. A. I must honestly say that I have no interest in the temples being thrown open, common dinners and the like, because we suffer thereby. My people have to put up with beatings and bitterness increases. After the common dinner at Vile Parle, the Maratha workers went on strike. If the caste Hindus had the strength they would have engaged untouchables as servants. But that has not been so. Hence I do not feel interested in the thing. I only want that social and economic hardships should end. A. The untouchables do not get houses to live in; they continue to suffer injustice and oppression. In one case, an untouchable was accused of having murdered a Maratha. I could have taken the case to Sessions and got him acquitted, but the magistrate changed the charge of murder to one of grievous injury. Now he will receive some punishment. You may not know what even I have to face. I do not get any other place to live in Bombay except the Port Trust chawl. In my village, I have to stay in the midst of the Mahars. In Poona, all others stay with their friends. I have to stay at the National Hotel and have to spend Rs. 7 and transport fare. A. Yes, I can perhaps stay there. But only perhaps. You will know if you ask Vaze. Once Vaze’s servant insulted me in his presence. I want to do away with all these hardships. G. I am at one with you. You ought to know that my fast has not ended yet, it is still on. To correct the agreement was a minor thing. The main thing still remains to be done. I am ready to give my life for it. All the injustices you mention ought to end. A. Birla said that I should be taken on the Committee for the Abolition of Untouchability. I declined to join, because what can I alone do? I would have to agree to the work of abolishing untouchability being done in accordance with your wishes. If we are in a majority we can get the reforms that we wish brought about. You wish that temples should be erected or wells should be dug. We might feel that that would be a waste of money that there should be another way out for it. G. I understand your point of view, and I shall keep it in mind and shall see what can be done. I thank you for your letter of the 12th instant enclosing your statement. I did not receive anything from the Associated Press, but I saw it in the daily Press. I hope you saw my reply. I wish that you could appreciate my viewpoint. Discussing the propriety or otherwise of Ranga Iyer’s two Bills [Ambedkar] said: The one-paragraph Bill is a very simple one. Its fair point lies in admitting that this custom is immoral. There is no such admission in the second Bill. BAPU: No, it is there in its preamble. BAPU: The one-paragraph Bill is certainly superior to the other. But the other lengthier Bill was brought forward because the first one could not be introduced in the Provincial Legislature. There is no contradiction in the two Bills. In one Bill untouchability ceases to be a disability and the law refuses to accept the argument based on untouchability. As a result of the second Bill, temple authorities are obliged to take steps under certain circumstances. If we can get both the Bills passed the trustees will not be able to put up any kind of obstacle. I take it upon myself to have all the temples opened within one month if we could get both the Bills passed. The sanatanists would prefer the second Bill. But speaking as a sincere sanatanist I would prefer the first Bill. A. ...Now the Government will have to issue orders against the sanatanists under Section 144 because they would be regarded as interfering with untouchables’ rights. 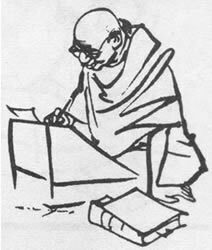 BAPU: However, I want you now to emphatically proclaim your ideas in very clear words. A. ...As far as we are concerned we have no immediate concern other than securing political power... and that alone is the solution of our problem... We want our social status raised in the eyes of the savarna Hindus. There is another point of view also. The object of this effort could be that you want the depressed classes to be retained in the Hindu religion, in which case I am inclined to believe that it is not sufficient in the present awakened state of the depressed classes... If I call myself a Hindu I am obliged to accept that by birth I belong to a low caste. Hence I think I must ask the Hindus to show me some sacred authority, which would rule out this feeling of lowliness. If it cannot be I should say goodbye to Hinduism... I am not going to be satisfied with measures, which would merely bring some relief... I don’t want to be crushed by your charity. BAPU: I have nothing to say if you have come with a final decision that you are not going to move your little finger to have this Bill passed. A. We have not made any decision. However, I have shown you how my mind is working. BAPU: I told you that I could have nothing to say if you have already taken a decision. A. We cannot ask the savarna Hindus to decide for themselves whether or not we are a part of them. You ought to demonstrate your determination by getting these Bills passed. BAPU: I am not asking you to do anything. I never wanted the depressed people to go on their knees to the savarna Hindus and ask them to get these Bills passed. Unfortunately, the solution of this problem is in the hands of a third power, which is in a position to mend or worsen the situation. A. I can set right the thing. BAPU: That is right. Of course I agree with you that it does not behove your dignity to approach the Hindus. I take the position—you might remember since I made the speech at the Round Table Conference—that we should atone for this. If you repudiate us and go away I would think that we only deserved it. A. The Bill mentions temple-entry but it makes no mention of entry into the sanctum sanctorum. Will they let a member of the depressed community place flowers on the idol, or will they let him offer a tray containing oblations? Malaviyaji has already declared that question of offering puja does not arise. BAPU: Temple-entry is meant for puja if anything. But if the language of the Bill is not right it can be amended and we can say ‘entry for the purpose of puja’. It seems there has been some misunderstanding somewhere in the case of Malaviyaji. He would not say what you attribute to him. Flowers, sweets or any other offerings from Harijans will surely be accepted. So we two agree on this point that there is no question of your imploring the savarna Hindus. When some savarna Hindus tell me that Harijans do not want to enter the temples I ask them to throw open the temple doors for the Harijans whether or not they wish to come in. They ought to have the satisfaction that they have done their duty. They ought to discharge the debt, which they owe whether the creditor keeps it or throws it into the gutter. But I must say that you ought not to say that you are not a Hindu. In accepting the Poona Pact you accept the position that you are Hindus. A. I have accepted only the political aspect of it. BAPU: You cannot escape the situation that you are Hindus in spite of your statement to the contrary. A. We ask of you that our silence should not be misconstrued. After that I accept your point. BAPU: I go one step further. You will not be able to go ahead a single step unless you maintain your position absolutely correct. I regard temple-entry as a spiritual matter through which everything else will bear fruit. A. The Hindu mind does not work in a rational way. They have no objection to the untouchables touching them on the railway and other public places. Why do they object to it only in the case of temples? BAPU: We are well caught on this point. I take up the question of temple-entry first of all because these people want to cling to untouchability in the temples. Many sanatanist Hindus say that they would admit Harijans in schools and public places but not in temples. I ask them to grant the Harijans equal status before God. It will raise their status. A. Supposing we are lucky in the case of temple-entry, will they let us fetch water from the wells? BAPU: Sure. This is bound to follow it. And it is also very easy. In accordance with my promise I send you herewith my opinion on your proposal. I hope you do not mind my having dealt with the matter publicly. I thought that the issue raised by you was of such momentous importance that if I discussed it at all, I should do so publicly. Pray excuse me for the delay in replying to your letter of 29-3-1934. It was not possible to reply earlier owing to incessant traveling. Whilst I should fall in with your scheme if it was accepted by the provinces, I could not shoulder the burden of pressing the other provinces to reopen the Pact in respect of the number of seats allotted in their cases. I have been trying to do what I can to placate Bengal, but so far without success. If the Harijan population in Bengal is as was believed at the time of the Pact they have nothing to complain of. If as a matter of fact it is much less than the figure on whose basis the number was fixed, I should think there would be no objection on your part to an amendment bringing the number to the figure required. In the afternoon Dr. Ambedkar interviewed Gandhiji along with Dr. Solanki and other friends of his. Gandhiji asked Dr. Ambedkar for a criticism of the work of the Harijan Sevak Sangh. The worthy Doctor suggested that the Sangh might economize on education and medical relief, as these were attended to by Government and there was a risk of duplication of effort in these matters. Again, education, in the first place, only benefited the individual; whether it would benefit society or not would depend upon what attitude the educated individual took up towards society. He would like the Sangh to concentrate on the primary object of securing full civic rights for Harijans, such as the right to draw water from public wells and to send children to public schools, without any discrimination being exercised against them. As regards cases of maltreatment of Harijans by villagers, such as those adduced by Dr. Ambedkar, Gandhiji said the Sangh was bound to deal with them. In fact, steps had actually been taken in numerous cases with more or less success. But in future Gandhiji would be glad if the Doctor was good enough to send him full facts about every incident of that description. In course of his tour of villages he had noticed that a change for the better was coming over them, but progress in that direction would be accelerated if he had the Doctor’s valued co-operation. As regards education, Gandhiji did not think there was overlapping. In fact, the Sangh was unable to cope with the whole demand, as the right type of teachers was not readily available. G. V. Naik, Amritrao Khambe and Baburao Gaekwad. As you may know, Rajaram Bhole is with me just now. He wants me to advise him as to the course he should take. Regard being had as to his precarious health; I have advised that it would be better if he could reconcile himself to some Harijan service against... to feed and clothe himself. The other alternative is to take up a business line. I see difficulties in his taking it up. He must then attend regular hours and be prepared to do best work, which is fatal for a man who is in perpetual fear of developing active T.B. But I told him that he should take your advice and be guided by you. He tells me he has already written to you. I know he will receive your reply in due course. But I would like you, for my sake, please, to hasten your reply so as to enable me to tell Rajaram what to do. DOCTOR AMBEDKAR, M. L. A. SO FAR AS I CAN SEE AT LEAST FOUR MEMBERS WILL FULLY REPRESENT DEPRESSED CLASS INTERESTS. NAMES BEING CHOSEN BY SARDAR. Thank you for yours of July 31 received yesterday. The Hindu-Muslim question is for me a lifelong question. There was a time when I used to think that when that question was solved India’s political troubles would be over. Experience has taught me that it was only partly true. Untouchability I began to abhor when I was in my teens, but it was a question with me of religious and social reform. And though it has attained a great political importance its religious and social value is for me much greater. But I know to my cost that you and I hold different views on this very important question. And I know, too, that on broad politics of the country we see things from different angles. I would love to find a meeting ground between us on both the questions. I know your great ability and I would love to own you as a colleague and co-worker. But I must admit my failure to come nearer to you. If you can show me a way to a common meeting ground between us I would like to see it. Meanwhile, I must reconcile myself to the present unfortunate difference. Vide Appendix “A Resolution”, before 9-8-1944.